I went to Ottawa last week to see the Van Gogh: Up Close exhibition. This painting was included. It was remarkable in real life, as is all of Van Gogh's work that I've seen so far. The unbloomed stems were much less blue than in this image. They were almost absent, ghost-like, as if they would someday emerge from the air rather than grow. "like a sort of soul-compass"
The book I just bought last Saturday at a used bookstore (The Art of Sylvia Plath, edited by Charles Newman (1970)) includes reproductions of several drawings by Plath (as well as a selection of her poetry, most of which was uncollected at the time). And then today, across my feed reader comes a link to a slideshow of Plath drawings being shown at a gallery in London. I don't have sufficiently comprehensive knowledge of Plath's body of work to connect this drawing to any particular poem (nor does my book attempt to do so). Some of the other drawings in the slideshow are quite thought-provoking if you stop to study them. "a lost or dimmed sense of bodily immediacy"
The French word "vœu" means vow or wish. A death-wish? Pride & Prejudice & Zombies? A face wiped clean of skin? "She seems to want to reawaken a lost or dimmed sense of bodily immediacy that may have belonged to her medium in less image-riddled times." 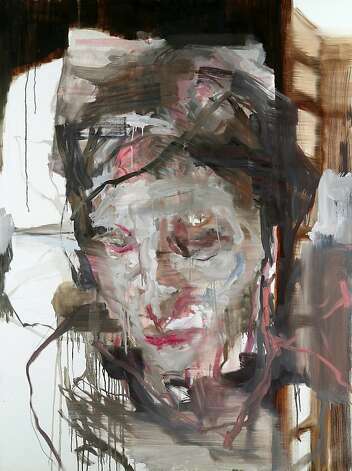 From Kenneth Baker's "Galleries" column in the Chronicle Saturday: "The rich, camera-fed drawings of Bay Area painter Richard Ambrose at Hespe remind us how little work an automatic medium - photography - may actually spare an artist who relies on it." Similarly, little work is spared the poet who draws on visual art, nor do we notice the absence of color in the poems that result. The mind supplies it. "the whole chain of formal and metaphoric connections"
The photo is a poem waiting to happen. Is it two trees or one? Are they embracing, fighting, dancing, posing? 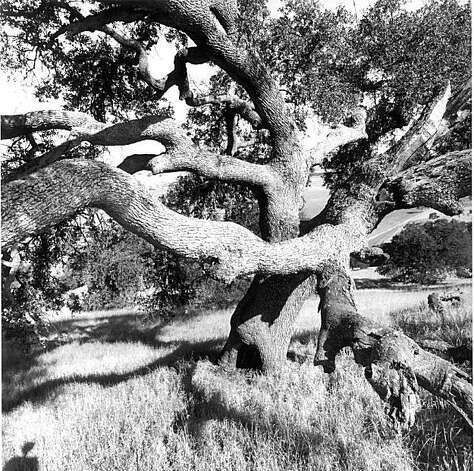 Do the branches, as Baker says, "structure the picture space like organic architecture and reawaken the idea of a tree as the core of existence"? Today's poem on Poetry Daily is an ekphrastic poem, "The Dark Figure in the Doorway" by Morton Marcus. 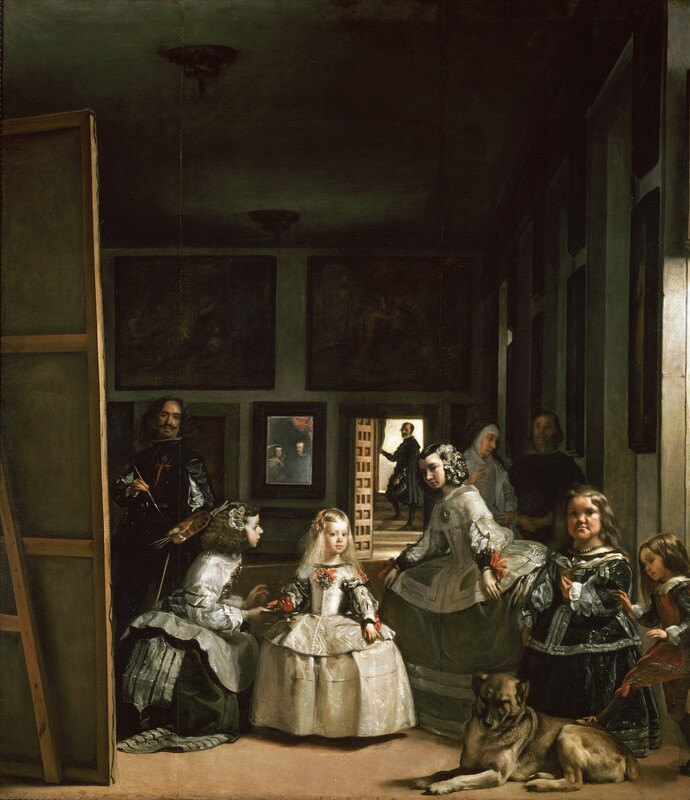 It takes only a couple of Google searches to find the art work in question ("Las Meninas" (1656) by Diego Velázquez). Being able to pull up an image of this painting, virtually on demand, certainly changes the experience of reading Marcus' poem.